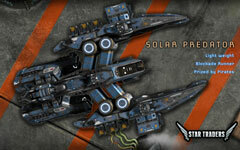 This months' Patreon wallpaper previews a new ship coming to Star Traders 2 soon, the Solar Predator. This beautiful design was first built by Alta Mesa Star Forges back in the Galactic Core. It is one of the designs that their ship wrights carried across the long dark of the Great Exodus and brought back to life in the new orbital foundries. Prized by pirates, a beloved blockade runner -- it is the Solar Predator! If you're a Patreon, snag the ZIP with all 3 sizes - 1920x1200, 1920x1080 and 800x1200 for mobile. Thanks to all of our month supporters!